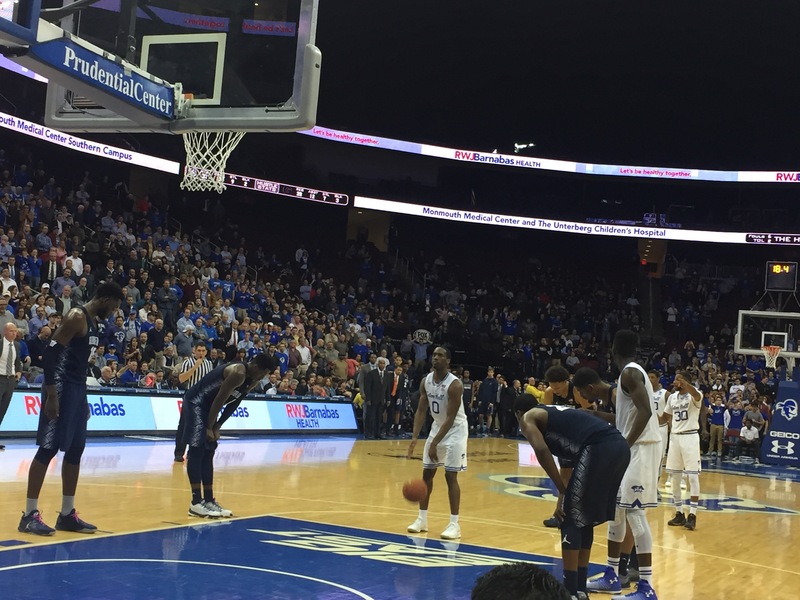 Newark, NJ- The final home game for the Seton Hall Pirates gave the 8500 fans in attendence a game to remember as the Pirates made a late run to put away the Hoyas in the final seconds. Khadeen Carrington hit two free throws to put the Pirates up by 3 with 18 seconds left. Georgetown’s final possession didn’t produce a quality shot and the fans exhaled as Seton Hall kept it’s NCAA Tournament hopes alive with a 62-59 win on Tuesday night. It was senior night at the Prudential Center as little used walk-on Michael Dowdy Jr. got the start for the Pirates along with fellow senior Madison Jones in the Seton Hall backcourt. The Hoyas, losers of their last three Big East games, looked to right the ship and get their season back on track with an upset over Seton Hall. The game had a fast pace from the opening tip with Rodney Pryor for Georgetown and Desi Rodriguez trading baskets as both teams capitalized on early turnovers. Neither team could hold a lead until Seton Hall went on a 7-0 run at the end of the first half to take a 38-30 advantage into haftime. Rodriguez had 17 points at the half while the Hoyas LJ Peak had 9 points. Seton Hall dominted the boards in the first half, holding a 21-10 rebounding advantage in the first half. The Hoyas quickly pulled out of their funk in the second half and erased Seton Hall’s lead with a combination of timely shots and Seton Hall falling into a malaise on the offensive end of the court. Freshman Myles Powell could not find his form from behind the three point line and junior Khadeen Carrington was cold from the field. The Hoyas took a five point lead with 8 minutes left as Seton Hall looked lost on offense. Rodriguez and Angel Delgado then decided to put the team on their back for the rest of the second half. “They took the lead by five and we said in the huddle that this is our season.”said Rodriguez. The junior forward converted several tough baskets and cut the Georgetown lead to one on a three point play. The Pirates regained the lead when Delgado muscled in a layup with 1:12 left in the game. Georgetown then committed a turnover on their next possession and Carrington hit two free throws to give the Pirates a 62-59 lead with 18 seconds left. The Hoyas final possession never amounted to a decent look at the hoop and Seton Hall got the win. Rodriguez was spectacular, notching 27 points as Seton Hall (19-10, 9-8 big east) heads to Butler next before the quest to repeat as Big East Tournament champions. Delgado had his usual double-double with 12 points and 13 rebounds. It was quite the night for personal achievements for Delgado who grabbed his 1,000th rebound and set the Big East rebounding record on Tuesday night. When asked to describe his team in one word tonight Seton Hall coach Kevin Willard said, “toughness”. With Seton Hall now 9-8 in the Big East, a win against Butler would lock them into a probable 9 or 10 seed in the NCAA Tournament.